Nike’s 2014 World Cup spot “The Last Game” is all about humanity. International fervor, nerve wracking goals and unnecessarily expensive stadiums are all things that come to mind when thinking about this World Cup. But I’m willing to bet that your favorite soccer stars playing their perfected clones in a do or die match wasn’t one of them. And let’s face it, nothing brings countries together like the fear of clones. This is exactly what happens in Nike’s five minute spot called “The Last Game” that follows some mad scientist hell bent on draining the humanity out of sports and making every athlete into monochrome perfection. How exactly do the humans manage to come out on top? Well apparently we have the alacrity of Gumby and the audacity to take selfies mid match. Nike must really be into humans beating nonhumans at soccer because back in the 90s they had a spot where the stars of the day took on demons from hell. No, not like Nike executive type demons, but actual fire breathing football disciples of Satan. Not to mention a very creepy logo. If anything, this just proves that soccer dominates everywhere else in the world but luckily through the internet, we Americans can join in on the party, even if we’re fashionably late. Thanks for sharing such nice post. Its actually right information for us. 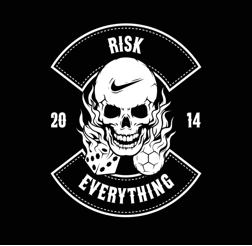 The new animated short is all a part of Nike’s ‘Risk Everything’ campaign, whose somewhat demonic fiery skull logo looks like it should be on the jacket of a motorcycle gang member.